Buying a Bowflex is difficult, to help you here’s an updated March 2019 Bowflex Max Trainer vs TreadClimber comparison. It’s difficult not because certain machines are either bad or good… but rather because every machine offered by Bowflex is pretty good. How on earth do you choose which one to buy? In particular, customers have the most trouble deciding between the Max Trainer 2019 and the TreadClimber 2019. Both are similar in looks, function, and results. But at the same time, they’re quite different machines. A basic glance at the pages for the Max Trainer (here >>) and the TreadClimber (here >>) will reveal that. If you’re stuck on the fence, this page will help you make your decision. We’ll go over both of the products briefly, then launch into their similarities and differences. Finally, we’ll try to help you make your ultimate decision, based on who you are and what you will be using your new Bowflex for – read on! The Max Trainer looks closest to an elliptical, but contains elements of both the elliptical and the stair stepper. When you workout on the Max Trainer, your body works in one fluid motion. You push with your legs and pull with your arms, repeating back and forth until you break a sweat. Want to learn more? Find our new Bowflex Max Trainer reviews here. The TreadClimber is much different from the Max Trainer in looks. You’ll see that there are two stepping pads, somewhat similar to what you would see on a treadmill. But, each stepping pad has its own individual track, and the tracks can elevate themselves to give you extra incline and resistance. Bowflex is running a time-limited spring sale, until the 28th only. You get between $300 and $500 off, and free shipping on the TreadClimbers. You get between $100 and $200 off, and discounted shipping on the Max Trainers. Enter coupon code SPRING19 at checkout. Let’s first look at the similarities. Both from Bowflex. This is obvious, but still important. Comparing machines from two different fitness companies is not a good comparison to make – the materials are different, the functionality is different – everything is different. With Bowflex, you get the same adherence to quality in both machines – the comparison you make is actually accurate. Both priced similarly. The price tags are very near to one another, and each series offers a few different models for you to choose from based on your fitness level and budget. Both contain all standard exercise equipment features. Both machines look like regular machines, but pack an additional punch. You’ll have plenty of room for your phone, water bottle, and other accessories. Both are adjustable, both are easy to assemble, et cetera. Max Series is full body. You use both your legs and your arms with the Max Trainer. With the TreadClimber, you primarily use your legs – your arms come into play only for stabilization. The Max Trainer can give you a full body workout whereas the TreadClimber cannot. TreadClimber is slightly better for leg development. If you are okay with not getting a full-body workout from your Bowflex, the TreadClimber will sculpt your legs at a faster pace because that’s all you are working on. TreadClimber is slightly more leisurely. With the TreadClimber, you can just walk. Even if you’re walking fast and at an incline, you’re still just walking. The Max Trainer requires a bit more focus from you to execute the full-body movements properly. The Max Series burns fat and calories at a faster rate. All Bowflex machines are good for burning calories, but the Max Trainer is easily one of the best. Even the cheapest model will have you burning up to 280 calories in a short 15-minute workout, which is relatively unheard of. That same amount of effort will earn you about 200 calories burned on the TreadClimber – still better than usual, but not as good as it gets. Either machine can help you lose weight and look great, but each one will specifically appeal to a certain type of person. Casual exercisers. If you like to watch TV or check your phone while you exercise, go with the TreadClimber. Your hands will be free and the motions are less jarring. Treadmill lovers. If you use the treadmill but are looking for something more, the TreadClimber is the perfect solution. Leg definition seekers. Certain people – ladies especially – will care more about leg and glute definition than they will about upper-body definition. The TreadClimber is good for this leg and glute development because you use your arms only for stabilizing, and not actual exercising. Casual to rigorous weight loss – you choose. You can set a leisurely pace, or you can exert yourself to the absolute maximum. Either works, and the Max Trainer is stable and quiet no matter what you choose. The only downside – if you’re going casual, you can’t do anything with your hands, but you can still watch TV or use the built-in tablet holder to watch a movie. Focused workouts. The Max Trainer doesn’t really let your mind wander. If you’re someone who likes to work out without distractions, pick the Max Trainer. Full-body definition. Tone muscle throughout your entire body and lose weight evenly. This is the #1 appeal of the Max Trainer – you hop on, do your thing, and when you get off, you have done everything possible for the day in terms of losing weight and gaining muscle. Decided on which one you’re going to go with? Hopefully, with this new Bowflex Max Trainer vs TreadClimber guide, we helped you clear your confusion up. Use the links below to learn more about each machine and place your order today. 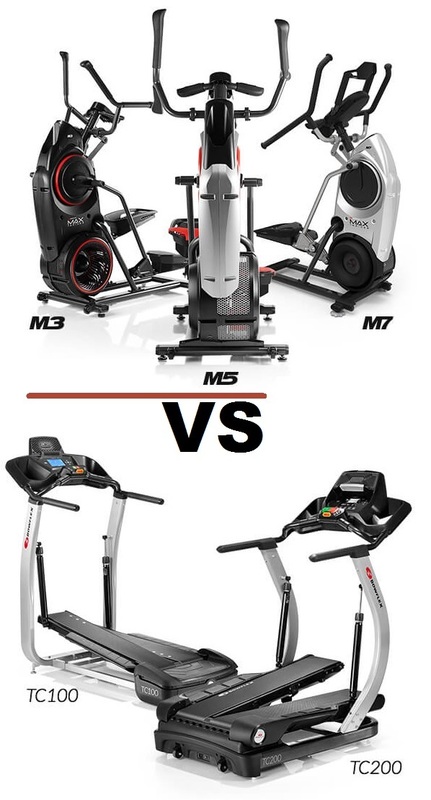 Bowflex Max Trainer M5/M6 vs. M3 Comparison (Mar. 2019): Which to Buy?